What's Next: The End of Media: If Federal Judge Richard J. Leon rules in favor of AT&T's $85-billion Time Warner purchase tomorrow, it will affirm that technology, media and telecom are all competing in the same arena and, pending appeals, could give tech and telecom giants the green light to pursue a slew of major media acquisitions. The Big Picture: It is entirely possible that tech and telecom companies will own all existing media companies, including Disney and Netflix, in the not-too-distant future. When we launched PACIFIC just over three months ago, a Hollywood media executive told us he believed that just eight companies -- Alphabet, Amazon, Apple, Facebook, AT&T, Charter, Comcast and Verizon -- would own all US media within the next ten years. We've put that theory to several Silicon Valley and Hollywood execs since then, and all of them either agree or say it is entirely within the realm of possibility. • Comcast vs. Disney for 21st Century Fox: Brian Roberts is likely to announce Comcast's rival bid for 21st Century Fox this week, sources close to the matter tell me. The bid will be north of $60 billion, they believe, at least 15% higher than Disney's $52.4-million bid. • T-Mobile and Sprint: John Legere has offered to buy Sprint for $26 billion. The deal would bolster T-Mobile's ability to compete against AT&T and Verizon, the dominant wireless providers in the US. • Hollywood studios like MGM, Lionsgate and Sony may all consider mergers in order to scale up and compete with bigger companies. CBS and Viacom may revisit a merger, despite opposition from CBS chief Les Moonves. 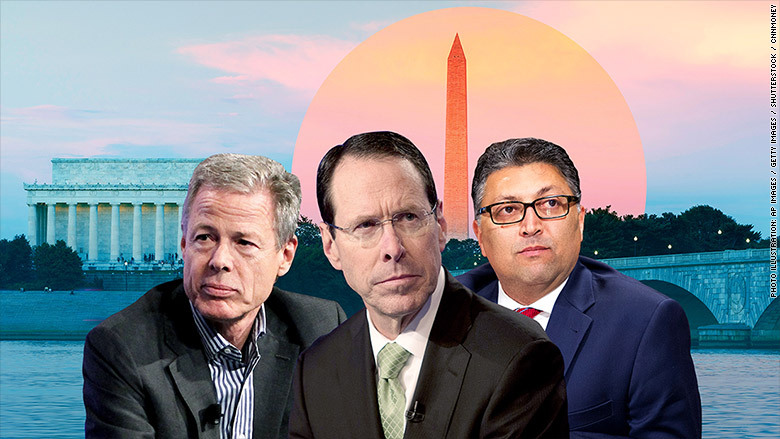 Plan B: If Judge Leon blocks the AT&T-Time Warner deal, it will likely put a freeze on M&A activity across industries and force tech, media and telecom companies to rethink their growth strategies. Welcome to PACIFIC, and welcome to the new Hollywood, which runs from Culver City to Los Gatos to South Lake Union. With the AT&T/Time Warner news coming, today's newsletter is focused on the intersection of tech and media, where there's already a ton of news this week. Fun fact: Amazon Studios' new chief Jennifer Salke now flies to Amazon's headquarters in Seattle roughly once a week, per NYT. Some advice: Sit on the right side of the plane going up, and the left side coming back. That way you get to see Mt. Rainer and Yosemite every time. The FCC has officially repealed net neutrality as of today, which means internet service providers can now charge fees to provide faster service for companies that are willing to pay more. • FCC Chairman Ajit Pai says the move will "protect consumers and promote better, faster internet access and more competition." • Opponents say it will allow providers to block websites, censor content and disadvantage the people and companies who can't afford to pay a premium. • Washington State is now the only state with net neutrality, after Gov. Jay Inslee signed a law effectively replacing the federal rules. What's Next: "The battle is just beginning," via WaPo's Tony Romm: "Pai must still contend with a challenge to his efforts in federal court, a campaign on Capitol Hill to roll his changes back and a slew of states that are looking to regulate in the FCC's place." What's Next: After years of small-budget niche projects, Amazon Studios is unveiling its plan to produce big-budget blockbusters, including "Lord of the Rings." The goal is to capture national attention, a la Netflix, and drive Amazon Prime subscriptions. • Amazon has money: With an estimated $4.5 billion spent on programming last year, Amazon Studios is spending heavily on talent and content rights. "There is a lot of talent out there looking for a home," Salke tells NYT. "We have the resources." • Amazon has ambition: Bezos said he wanted the next "Game of Thrones," and Amazon Studios came back with rights to "Lord of the Rings," which cost them $250 million. Salke says the deal closed last month and she's currently talking to writers. The Big Picture: Amazon, Apple and Netflix are spending billions on talent and content and radically driving up the cost of business in Hollywood. They are also pursuing major tentpole projects -- the next "Game of Thrones" -- to make their platforms essential to consumers. Bonus: Amazon Studios has made a straight-to-series order for an anthology based on the New York Times' popular Modern Love column. "Vice Media Was Built On a Bluff" by NYMag's Reeves Wiedeman: "For almost 25 years, Shane Smith's plan for Vice was that, by the time the suckers caught on, he'd never be stuck owning the company he co-founded." • "Netflix operates by a simple logic, long understood by such tech behemoths as Facebook and Amazon: Growth begets more growth begets more growth." • "When Netflix adds more content, it lures new subscribers and gets existing ones to watch more hours of Netflix. As they spend more time watching, the company can collect more data on their viewing habits, allowing it to refine its bets about future programming." • How Netflix's Ted Sarandos sees it: "'More shows, more watching; more watching, more subs; more subs, more revenue; more revenue, more content.'" The Big Picture: "Netflix has gone from around 33 million global subscribers before House of Cards premiered to over 125 million today. Wall Street analysts have predicted Netflix could flirt with 200 million subscribers by the end of 2020; by 2028, one Morgan Stanley analyst has said, 300 million is possible." The Bad Picture: "Netflix doesn't actually make any real profits right now because of the billions in debt it's taking on as it builds up its library." Netflix has more than $6 billion in debt and at least $15 billion in streaming content obligations. • "Hulu's losses have ballooned in recent years—up 140% to $436 million in the first quarter alone." • "Hulu's cash burn is approaching half of Netflix's. Yet Netflix has about six times as many subscribers and is expanding globally, whereas Hulu is a US-only service, which means Netflix has more opportunity to recoup the investment." • "Traditional media companies historically have been hesitant to invest heavily in digital startups ... Hulu offers Disney or Comcast a chance to change that narrative and become more competitive in an entertainment sector dominated by internet services." It's been nearly one year since Amazon's surprise purchase of Whole Foods. The $13.7 billion deal is upending the grocery industry and forcing its rival to retool how they do business. • "Grocery chains have accelerated planned investments in online delivery and pickup services, in some cases bumping plans ahead to two- to three-year timelines instead of five to seven years." • "Dozens of supermarkets have struck deals with Instacart Inc., an online grocery-delivery service that has expanded to more than 200 retailers from 30 before Amazon's deal." • "Kroger and Walmart and Target have all stepped up e-commerce acquisitions, with more technology investment expected." What's next: Amazon is continuing to roll out its Whole Foods perks program to Prime members, entering 10 new states on Wednesday and going nationwide this summer. Bonus: Amazon wants to crush La Croix. What next: "From In-N-Out to Chateau Marmont, Anthony Bourdain understood what makes L.A. great," by LAT's Jenn Harris.